"41UR315, Burial 24, Vessel 119" by Timothy K. Perttula and Robert Z. Selden Jr.
DECORATION (INCLUDING MOTIF AND ELEMENTS WHEN APPARENT): The rim has five rows of horizontal neck banding. The vessel body has four rows of vertical appliqued fillets that extend from near the rim-body juncture to 2.0 cm above the vessel base. These appliqued fillets divide the body into four panels filled with vertical brushing marks that were subsequently smoothed over before firing. 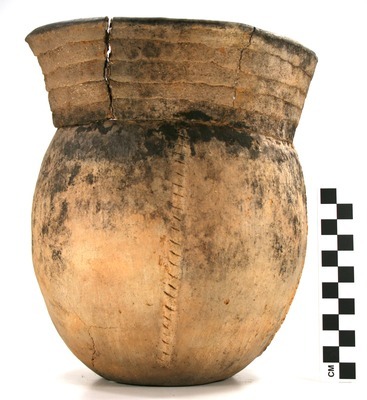 LaRue Neck Banded jar, Vessel 119, Burial 24.